There is this feeling that I have about biscuits; this sense of accomplishment every time I take a pan or skillet full of warm flaky biscuits out of my oven. I can’t help but smile and remember the journey that I took to get here. Biscuits were the very first thing I ever learned how to make, with the guidance of 2 very different cooks.. Something you enjoy, something that seems so simple can turn out to be an innumerable lesson in patience and leaf lard. The buttermilk must be cold..
Then never use shortening cause only the “fat of a pig” can fluff those biscuits.. These rules and processes began to take away from my adoration of the beloved buttery southern gems.. It took a day in the kitchen with my great aunt for me to turn back around and keep trying. Her words were to stop overthinking what you’re preparing.. Take the love you feel in your soul for those sitting around the table and let it flow to the food and it’ll show in those biscuits.. So with that I walked down this path to biscuitville with a handful of cream biscuits. In their simplest form, Cream Biscuits are 2 cups of self-rising flour and 1 cup of cream.. The end result is a flaky biscuit that could win over anybody. There is a batch of biscuits made every Sunday in my house, some more complex than others. This is sort of a necessary act for me, reliving this tradition. 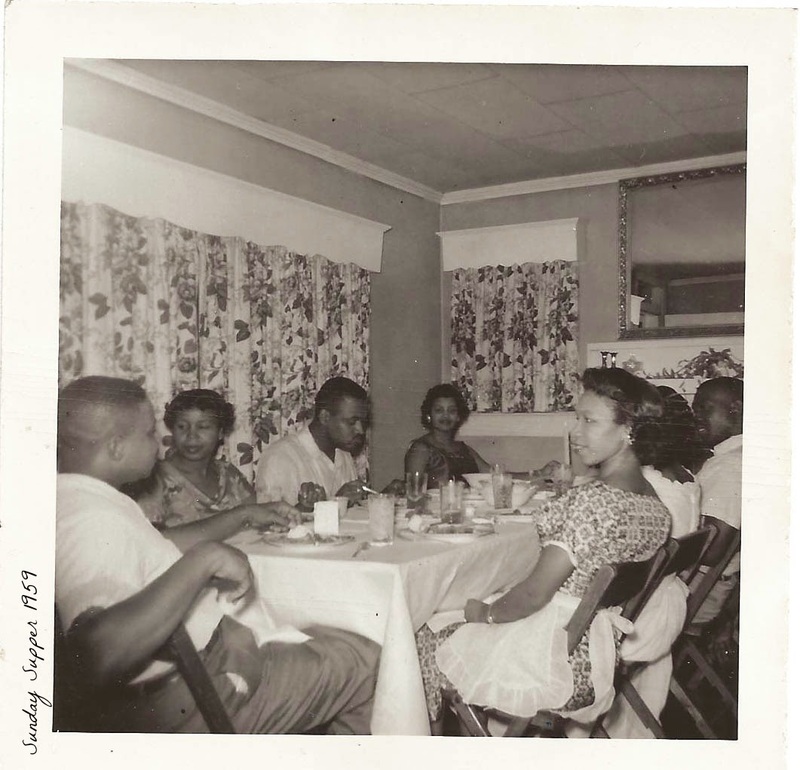 Sunday dinner meant a gathering at the table, normally my Aunt Mabel’s house.. There were always biscuits and in the summer some church folk would meet in the park and break bread together. There was this one lady who made this “cake” and I use that term loosely because this cake was really one large cream biscuit that she’d cook in a cake pan, then slice through the middle and add homemade orange marmalade and whipping cream to the center.. It was everything a cake should be and the inspiration behind these biscuits.. 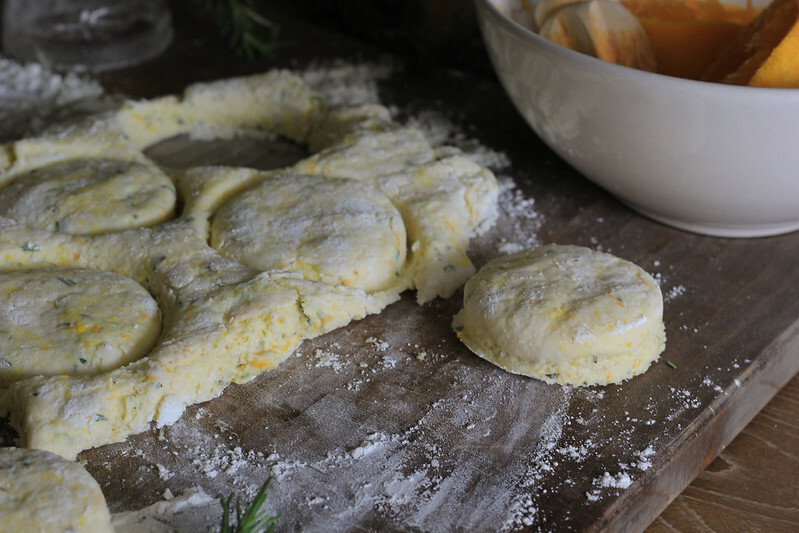 Warm biscuits that are studded with bits of orange zest and rosemary are nothing short of incredible. They’re also very simple with impressive results. Add the flour to a large bowl. Make a well in the center and pour in cream stirring until flour is moistened. Add in orange zest, juice and rosemary. Mix with spatula until the dough begins to pull away from the sides of the bowl. If there is flour remaining on the bottom of the bowl add some additional cream (about a tablespoon at a time). 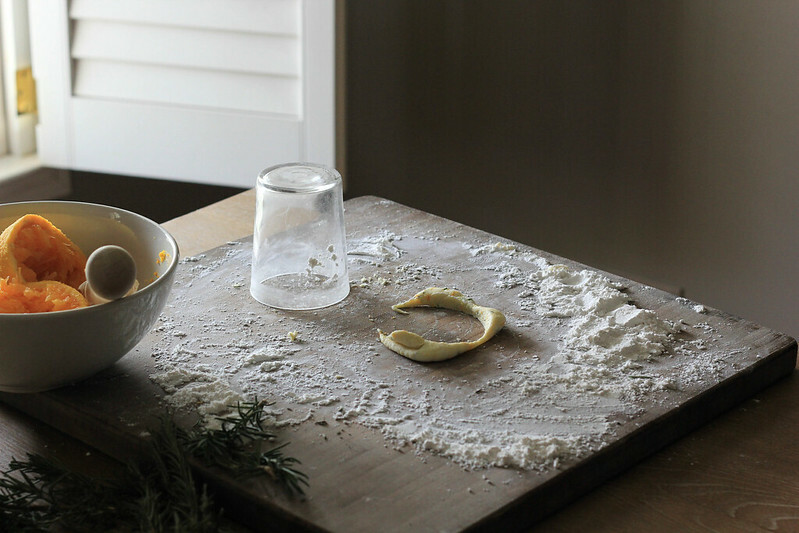 Lightly sprinkle a board or other clean surface with flour. Turn dough out onto board and sprinkle a little flour on top of the dough. With floured hands, pat dough out to a ½ inch thick, fold dough in half and pat out into a ½ an inch thick for a normal size biscuit or about ¾ inch for taller biscuits. Brush off any visible flour from the tops of the biscuits. Using a biscuit cutter (or the rim of a drinking glass) cut out each biscuit. Use the scraps to make additional biscuits. 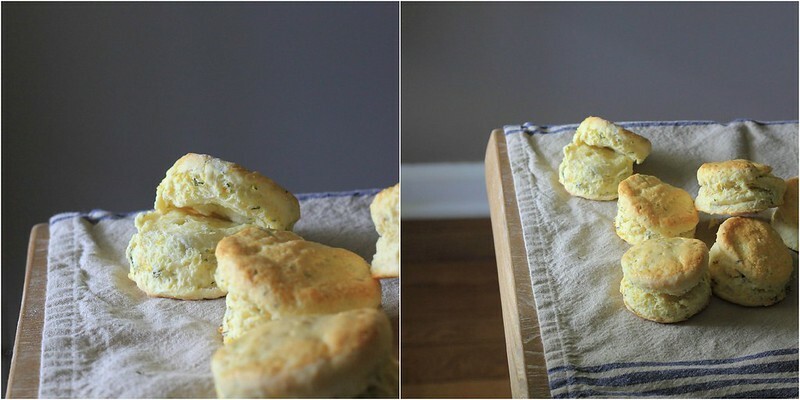 Place biscuits onto a buttered or greased baking pan. Bake biscuits for a total of 10-15 minutes. Remove from the oven and serve while warm. 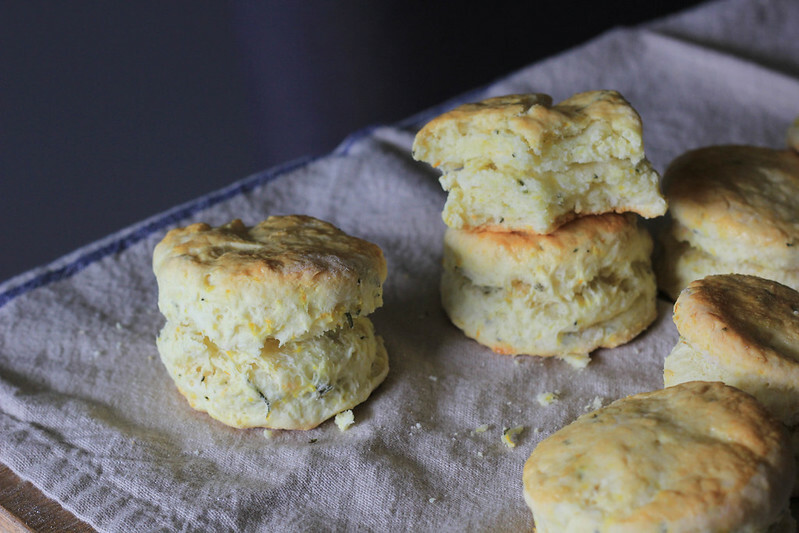 Brush biscuit tops with melted butter if that’s your thing. A few things: To give biscuits a nice brown top, brush them with the egg white of one egg. My grandma uses a egg yolk and cream egg wash but this can cause your biscuits to get brown rather quickly if not watching. If using a skillet, warm the skillet in the oven first for about 10-15 minutes then add your biscuits to the skillet. This makes for a crustier bottom on the biscuit..